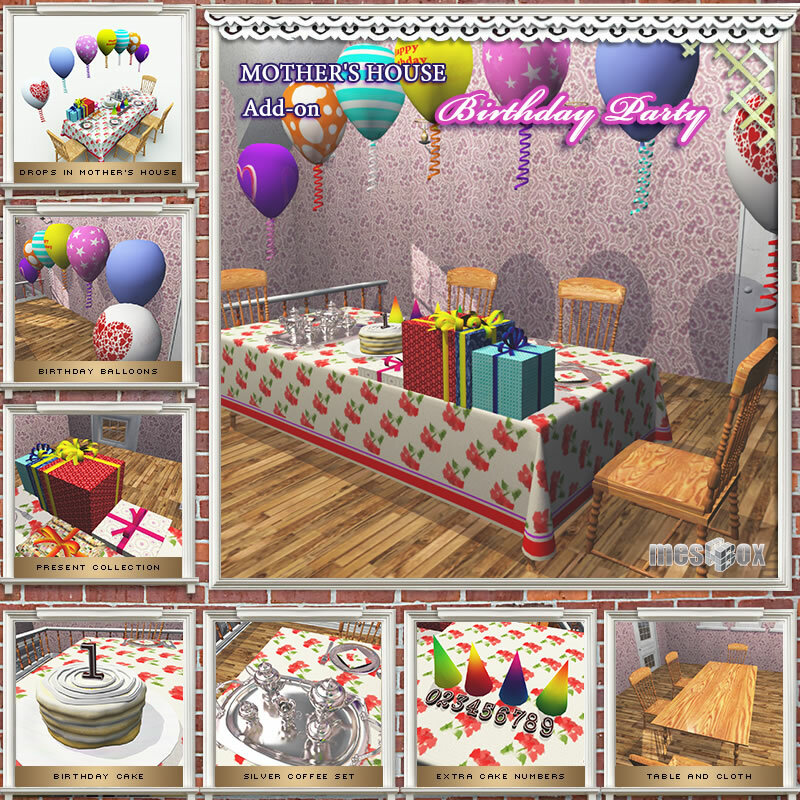 Birthday Set is a drop in add-on collection of furniture and objects for Mother's House, a complete building in the Home Town series. 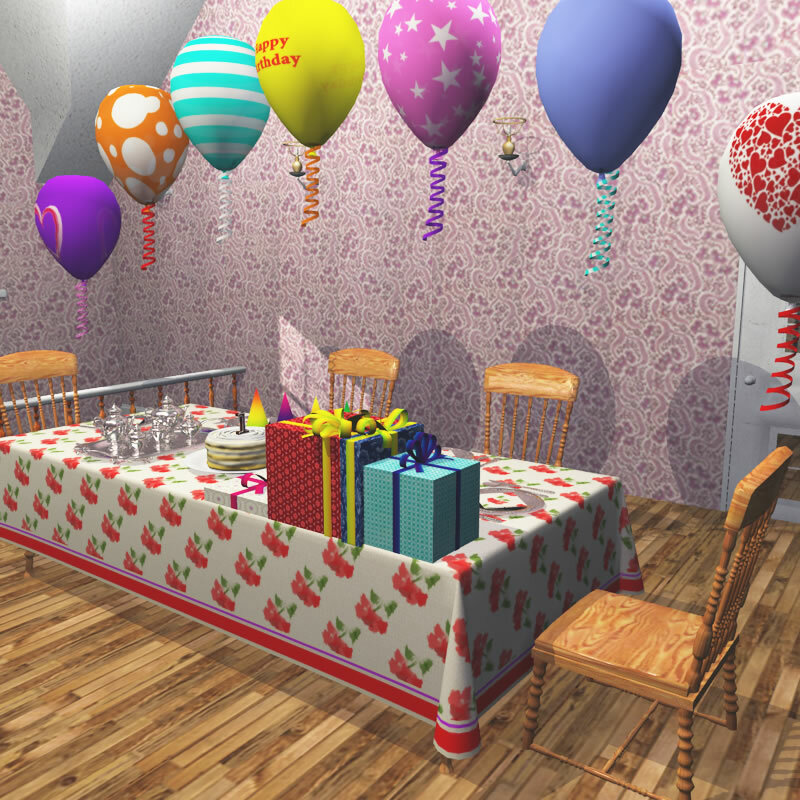 Put the Birthday Set in the large, open area in the second floor, and you have a party! 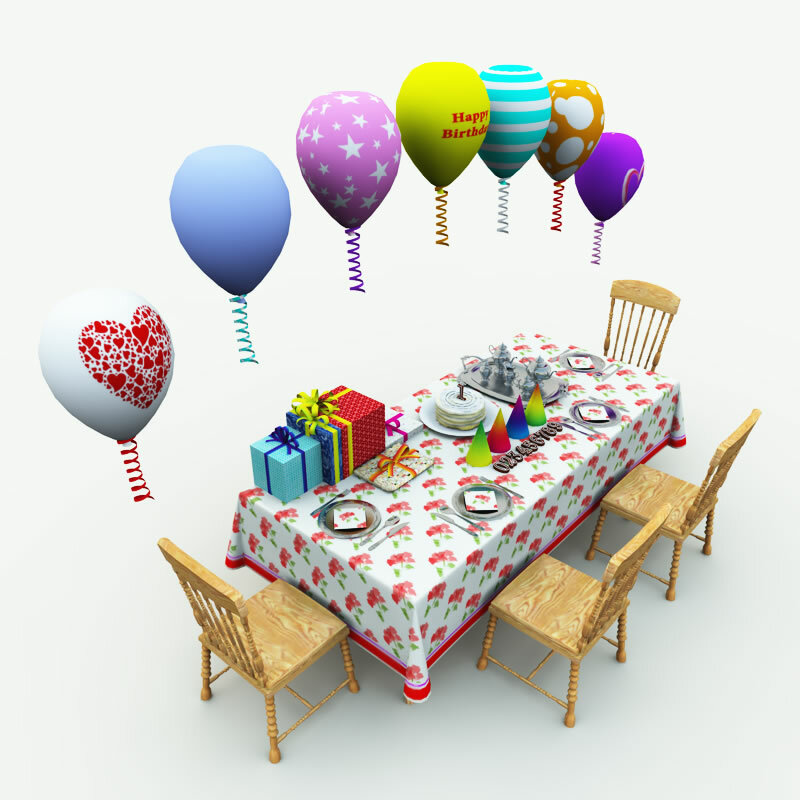 The set includes a table-cloth covered festive table and chairs, full place settings, hats, balloons and a present collection. 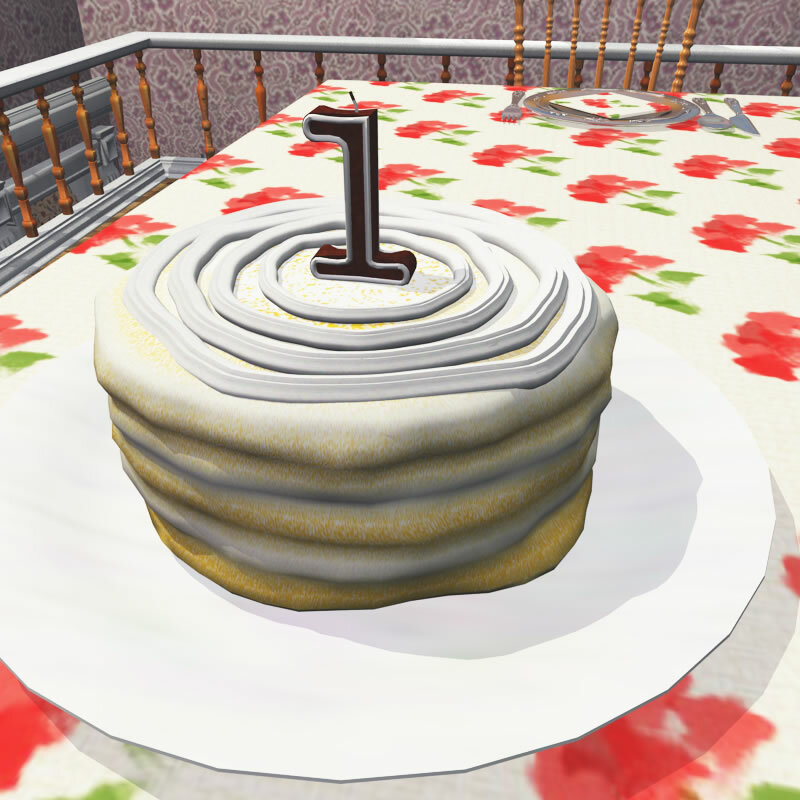 Then comes the birthday cake, with a selection of numerical candles you can add to make it a birthday party for any age. 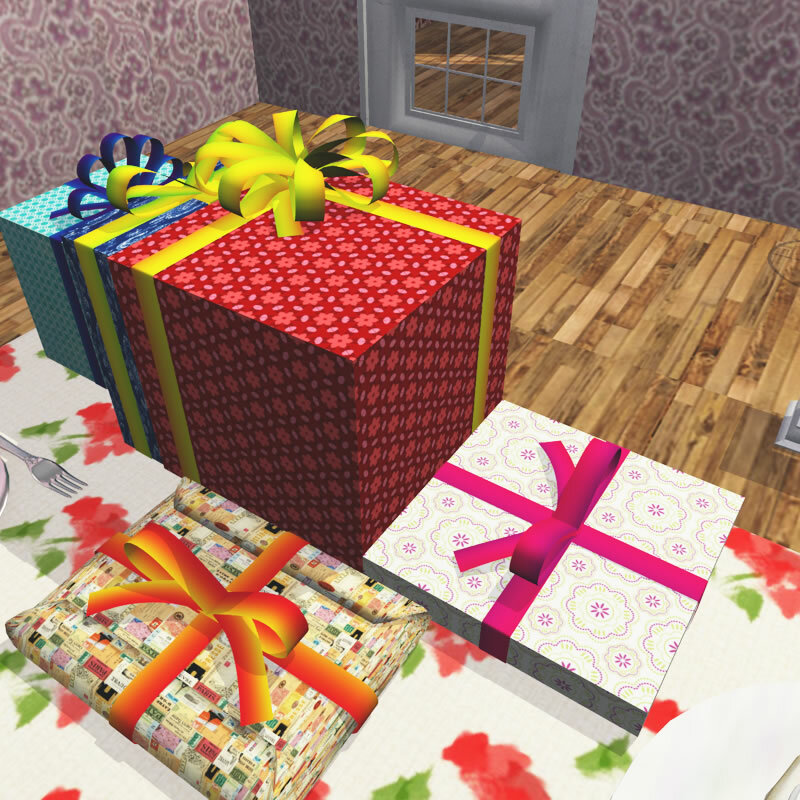 This is an add-on product for Mother's House, a complete building in the Home Town series, but you can use Birthday set without Mother's House. Home Town Volume 1 is a collection of models based on classic American country towns found along or off a highway- as they appear now, but much as they would appear at the turn of the century. Each building has a post victorian look, with some modern conveniences but with modification can be easily used for almost any modern era. Mother's House is a cute, post Victorian two story country house, with ornate and beautiful ornamentation and completely furnished. 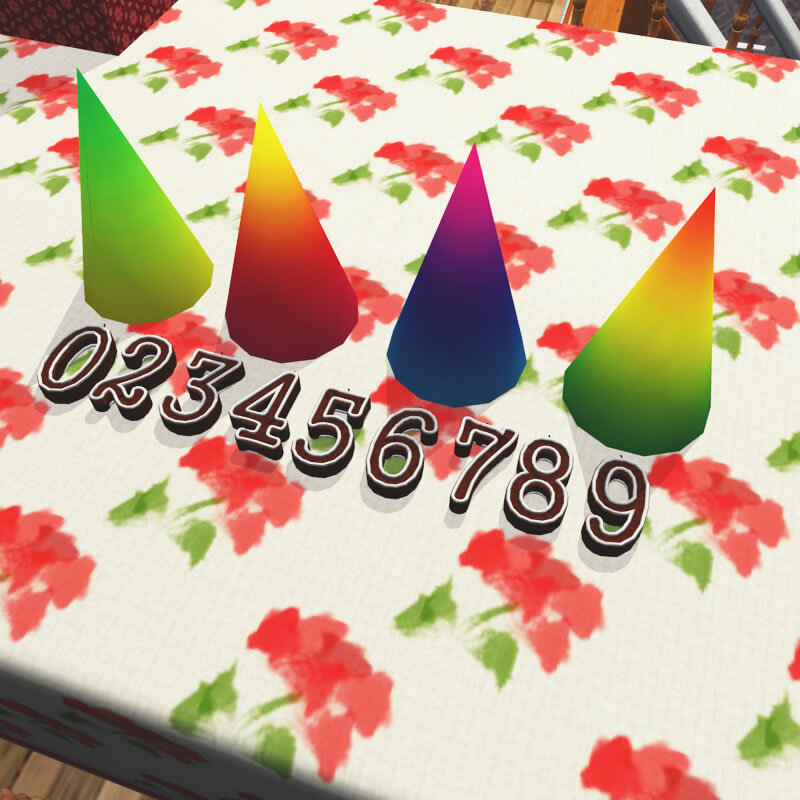 Select this mode set if you want to incorporate geometry of the model in any 3D game or real time simulation. 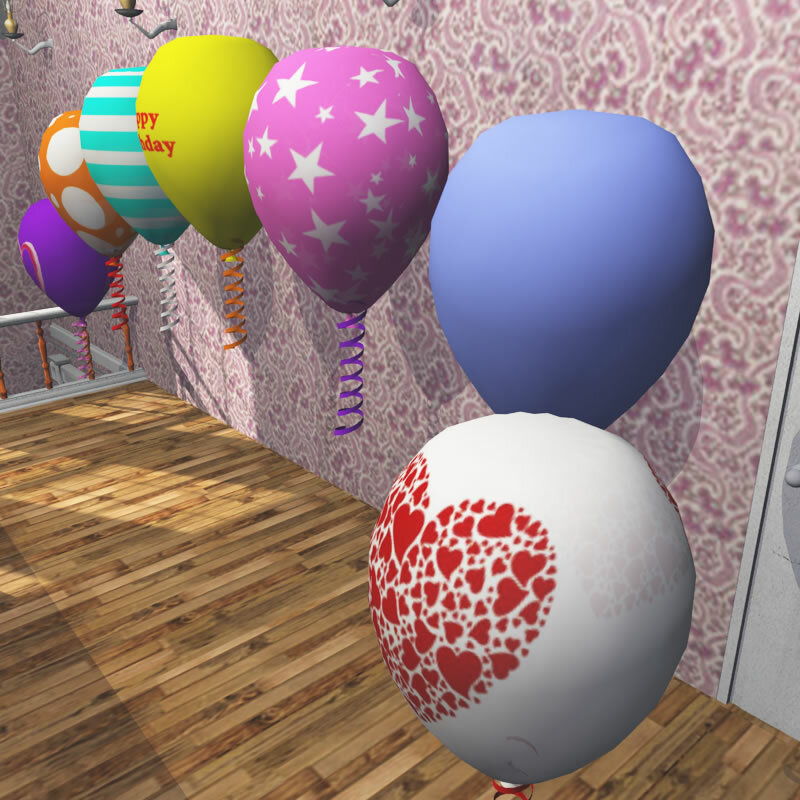 Also includes access to the Poser, Shade, Vue and Bryce versions. This set is compatible with Poser 7 or higher and DAZ Studio 4.5 or higher. R2 version has an organized runtime, with separate props (pp2), character based models (cr2) and separate OBJ versions of the building. 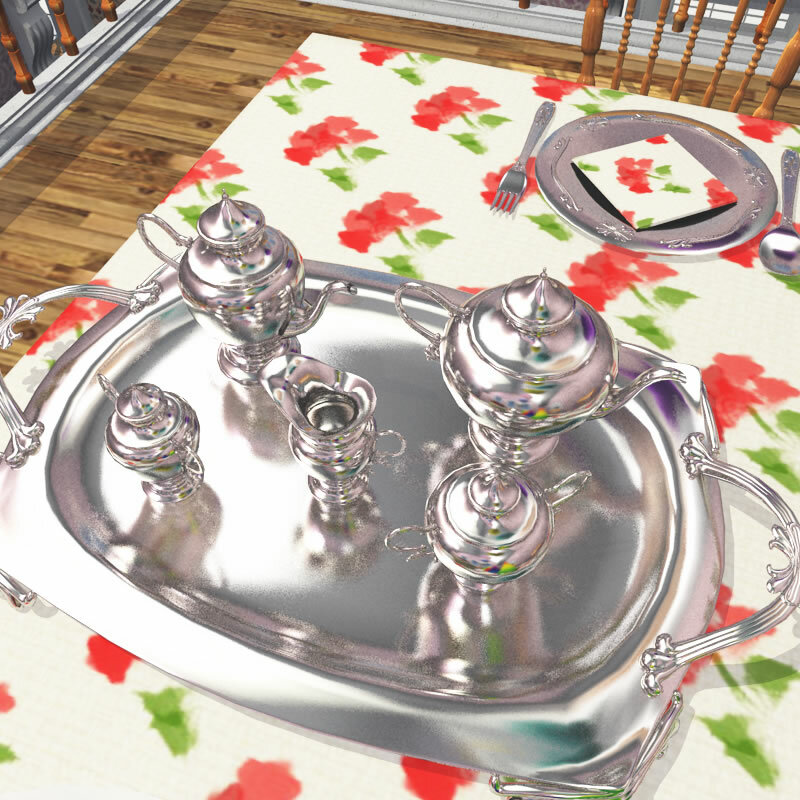 Meshbox Design is the premier provider of 3D models, characters, buildings and more for Poser and DAZ Studio. This model is compatible with both Poser 7 and higher and DAZ Studio 4 or higher. 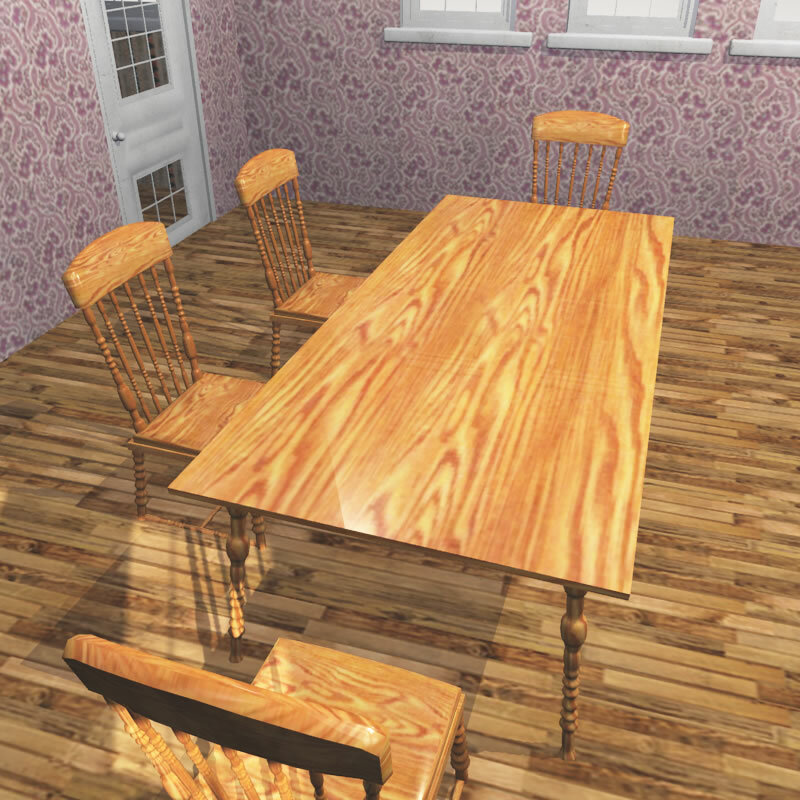 This set is compatible with Blender 1.7.1 or higher. Meshbox Design is the premier provider of 3D models, buildings and environments for e-on software's Vue natural scenery software. This model is compatible with Vue 7 or higher.